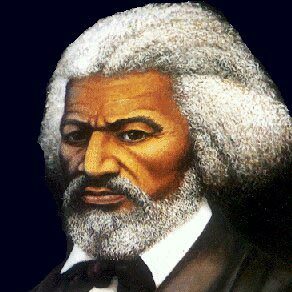 February 14, 1818 Frederick Douglass, abolitionist, women’s suffragist, editor, author, and statesman, was born enslaved in Tuckahoe, Maryland. Douglass taught himself to read and write and in 1838 escaped from slavery. He delivered his first abolitionist speech at the Massachusetts Anti-Slavery Society’s annual convention in 1841. In 1845, he published his autobiography, “Narrative of the Life of Frederick Douglass, an American Slave,” and within three years it had been reprinted nine times and there were 11,000 copies in circulation. From 1845 to 1847, Douglass lectured throughout the United Kingdom to enthusiastic crowds. During that time he became officially free when his freedom was purchased by British supporters. After returning to the United States, he began producing the North Star and other newspapers. In 1848, Douglass attended the first women’s rights convention and declared that he could not accept the right to vote himself as a black man if women could not also claim that right. During the Civil War, Douglass helped the Union Army as a recruiter for the 54th Massachusetts Regiment and after the war he served as president of the Freedman’s Savings Bank, marshal of the District of Columbia, minister-resident and consul-general to the Republic of Haiti, and charge d’affaires for the Dominican Republic. In 1877, Douglass bought Cedar Hill in Washington, D.C. which has been designated the Frederick Douglass National Historic Site. Douglass died February 20, 1895. In 1965, the United States Postal Service issued a commemorative postage stamp in his honor and numerous streets, schools, and other buildings are named in his honor. The many biographies of Douglass include “Slave and Citizen: The Life of Frederick Douglass” (1980) and “Frederick Douglass, Autobiography” (1994).